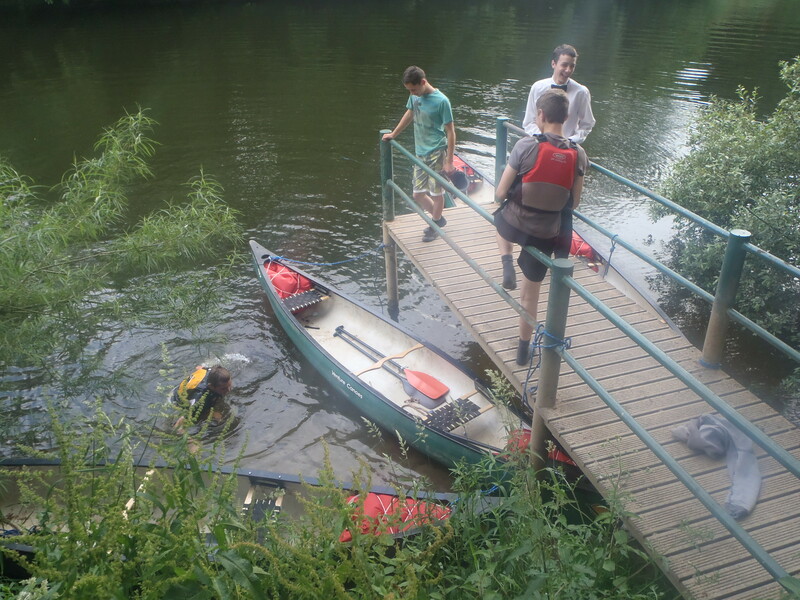 The first day of July heralded the much anticipated first ever Launceston College canoe based Duke of Edinburgh’s Award assessed expedition. Students had been preparing for this expedition since November. It was therefore no surprise that by 9am there was a buzz of excitement as the 11 Silver DofE students gathered to load the minibus and canoe trailer with everything that they would need for this adventure. 6 hours, 1 service station stop and a couple of traffic jams later the group arrived at the base campsite in Shropshire. Everyone quickly set to work establishing camp and making preparations for the three day expedition. The canoes had to be unloaded from the trailer to be checked after the journey, have their buoyance bags attached and inflated, and each boat had to have its British Canoe Union boat licence stuck on. By the time that dinner was ready everyone was packed and the final preparations for the expedition were complete. After dinner the group and staff relaxed by getting together to practice their throwline and rescue skills. This caused a lot of laughs as throwlines whizzed through the air and occasionally into a nearby tree. Day 2 was to be the first day of the expedition. By 7am everyone was up and the campsite was buzzing with the last minute final preparations. The two teams were so eager for their adventure to begin that everyone was ready to leave for the put-in early. This was just as well as the main road to the start was closed causing a lengthy diversion. Once at the start, both teams had a last minute chat with their assessor before setting off. 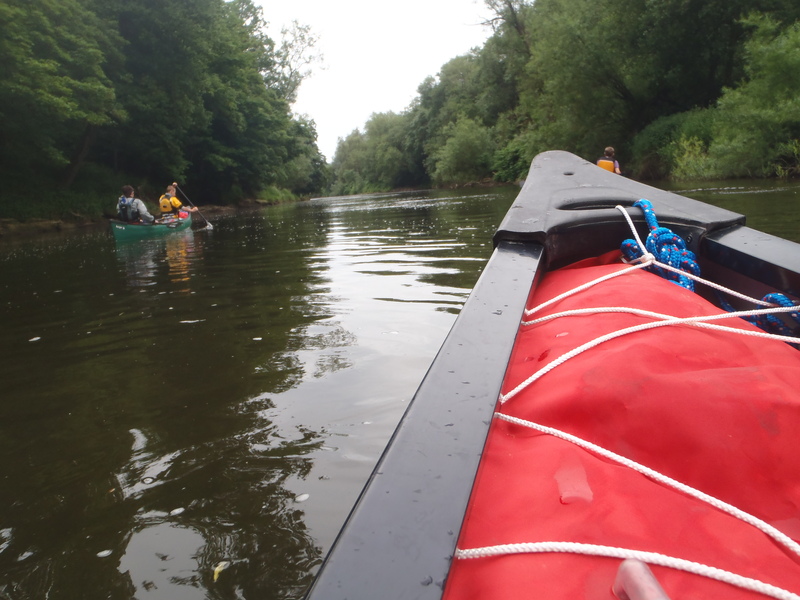 Despite the low water levels, the teams found that the river Severn was moving quickly. 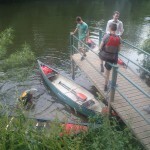 However, this gave both teams ample opportunity to stop and explore the river banks. The boys’ team had some fantastic games of hide-and-seek to ensure that they didn’t get ahead of their route card times. The low water level also meant that the river banks were very high and not much of the surrounding countryside could be seen from a boat. This was a surprise navigational challenge, but both teams soon adapted to this and got used to navigating by counting river bends and observing bridges and powerlines crossing the river. Leaders on the water also had fun finding that the windy conditions were a good opportunity to get a canoe sail out to play with. At lunch the leaders swapped between the bus and the canoe. This was also the point when Bridgnorth experienced a pirate battle as the girls’ team filmed scenes for their project. When the teams arrived in camp that evening the boats had to be unloaded and hauled up the bank, out of the water before the teams could begin to put up their tents. This is no easy task at the end the day. However, they set to work and quickly got the task done thanks to their experience gained on the practice expedition. 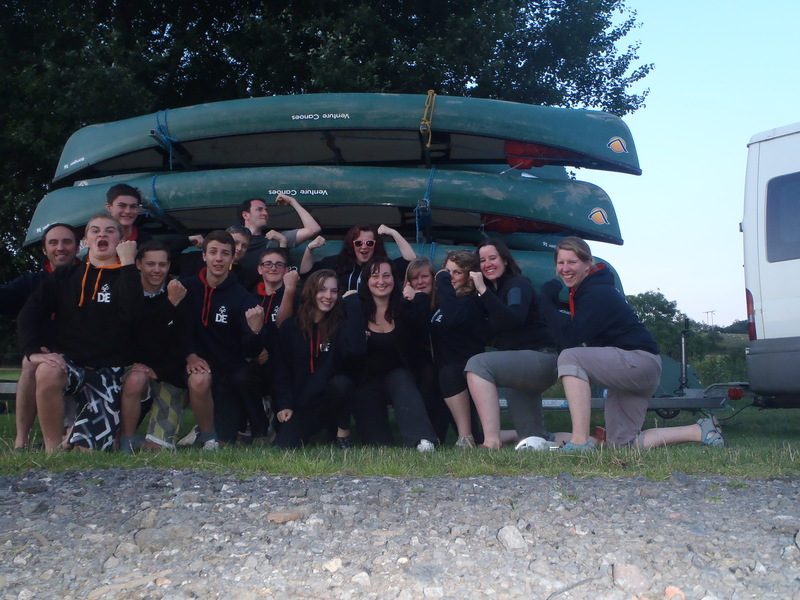 Later that evening the teams found themselves joined in camp by another DofE canoeing group who were doing their practice expedition. The next morning the teams planned a more leisurely 10am and 10.30am starts. Both teams used this later start as an excellent opportunity to do more work on their projects. James Bond and the Canoe Terrorists were leaping out from behind trees and the girls’ team transformed themselves into pirates armed with swords, complete with drawn on facial hair and tattoos. Day 3 was another day of dodging fishermen who had a habit of hiding themselves on the river banks. The lunch stop for the day was in Arley, a village that is home to the Hogwart’s train station. Both teams decided they wanted to take the opportunity to make the short walk up the hill to visit the station. The girls’ team decided to make the station their lunch stop instead of carrying on down river and enjoyed a picnic at the station. The boys’ team found the bridge here a brilliant location to film a fight scene between James Bond and the Canoe Terrorists. Leaders has an enjoyable coffee stop watching the film unfold as James Bond ran backwards and forwards across the bridge wearing a suit and bow tie and armed with toy guns. That afternoon the teams found the river a little more exciting as it presented a couple of bouncy bits of water and one small drop. The pirates also discovered treasure on a small river-side beach. Camp that evening had a pontoon over a deep and slow moving section of the river, once again presenting an excellent filming opportunity for James Bond. Here one of the final scenes was filmed, with one of the canoe terrorists being thrown from the pontoon by James Bond. The final expedition day was an early start with both teams being on the water by 8.30am. 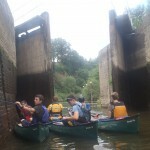 This was the longest day for the teams and potentially the trickiest as teams had to pass through 3 sets of lock gates. 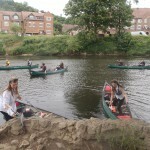 The leaders set off in their canoe first so that they could be at the first set of lock gates ahead of the teams. As the leaders approached the lock the gates began to open, causing the leaders to look around expecting to be mown down by a large boat. After a quick chat with the lock keeper it was discovered that the canoes were able to pass through all of the lock gates that day. Something that would make the final day a lot easier as the teams were planning to portage all three locks. The leaders and both teams went through the first lock together, with some apprehensive and unsure what to expect. Luckily there was no sudden drop in water level or tidal wave as the lower gates opened. 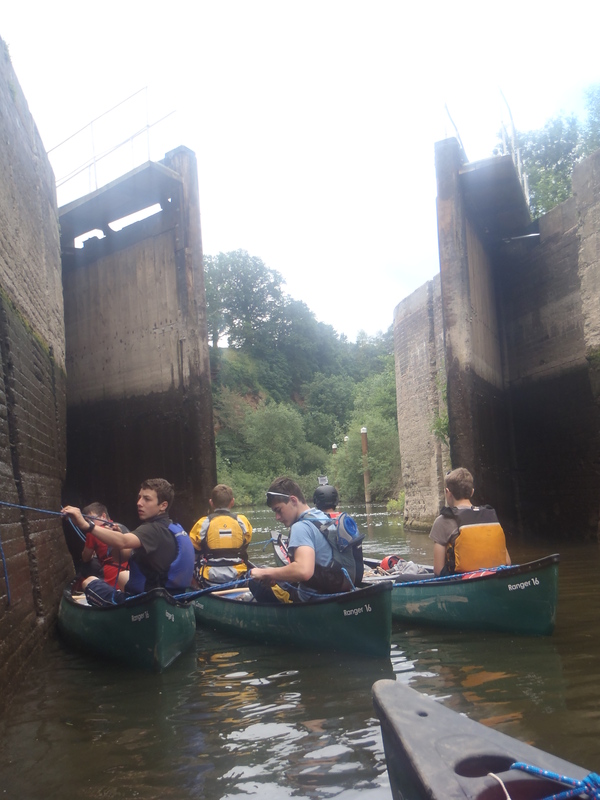 Although it did feel like a scene from Lord of the Rings as the big gates opened to release the canoes. Once through the lock both teams had to readjust their timings for the day as they would only need to allow 10 minutes at each lock as opposed to 1 hour. However, the prospect of an earlier finish that day definitely outweighed the hassle of having to adjust route cards. This part of the river was navigable under British Waterways so the teams encountered a few narrow boats moving up and down the river. At the final lock the teams were met by their assessor who debriefed them and gave them the opportunity to reflect on their experience. Everyone enjoyed the experience and was impressed with what they had achieved. 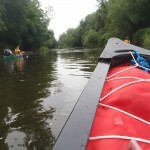 The final stretch of the day was an hour’s paddle into the centre of the city of Worcester. 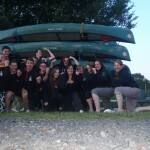 The canoes beat the minibus to the finish point and by the time the bus arrived the group had unloaded and got their boats out of the water. Equipment was swiftly loaded and the group returned to base camp. Once back at base there was lots to do, with equipment having to be cleaned and sorted before anyone could relax. Day 5 was another early start so that the long journey could begin early. Many members of the group found themselves nodding off on the way home and the usual sleeping on the bus photos were taken. A quick planned coffee and second-breakfast stop at Birmingham had to be followed by an impromptu stop 25 miles on as one of the ropes holding the boats on the trailer had worked loose. Once this was taken care of the group were on the road again not stopping until lunchtime. By the time the group got back to College everyone was tired and a little stiff, but there was still a lot to be done. A week’s worth of expedition kit and the boats all had to be put away before anyone could leave. 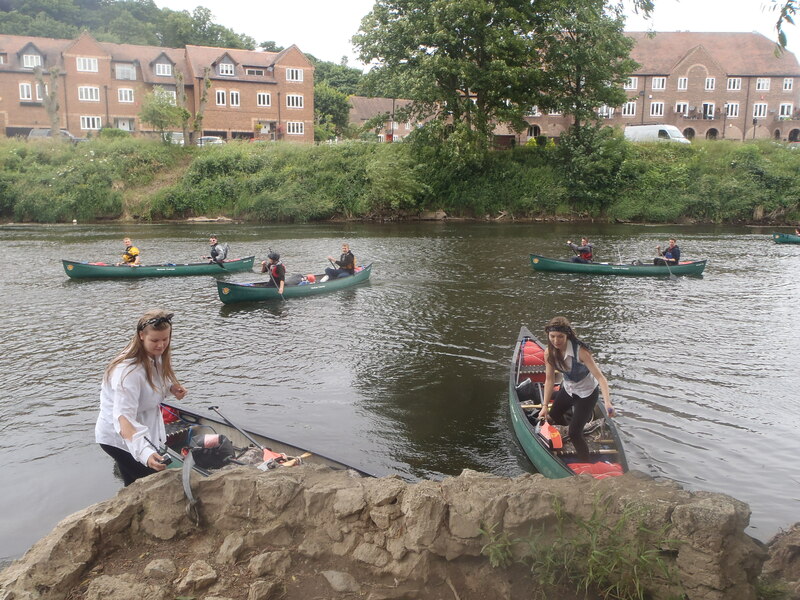 This has been a fantastic week that I am sure that both students and staff will never forget and I hope that it is the first of many Silver DofE canoe expeditions. I would like to say a massive congratulations to the Silver DofE canoe group for all of their hard work which made this such a successful expedition. Also a big thank you to everyone that has been involved in helping the group prepare for and undertake this expedition. Copyright © 2018 Launceston College. All rights reserved.